The stored procedure: "sp_audit_purge" the data of which table clean? The table db_audit.AUD$100004_xxx of Central Repository ? Please show me the steps to enable the sp. 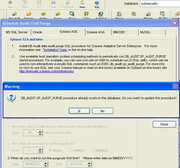 Please see http://www.softtreetech.com/dbaudit/db_audit4.pdf, pages 29-30. "Install" button installs data audit trail purge procedure sp_audit_purge and schedules it periodic run. 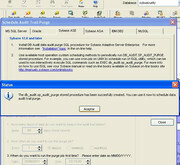 I see, there is no "Install System Purge" button and procedure for your versions of Sybase ASE. That's because your Sybase version doesn't need them. It takes care of automatic audit trail purge and rotation. Yes, I would have liked the tool do for me, and I don't run the 'truncate table sysaudits_01' and 'truncate table sysaudits_02' commands every day and empty the log table area with 'dump tran sybsecurity with truncate_only'. Like the other engines are similar commands. Once you have the central repository properly working, the repository replication jobs will take care of deleting old records from sysaudits_XX tables automatically. To confirm: The time indicates in part of keep days?